Earlier photo of then Major Nicole “Fifi” Malachowski in her official Thunderbirds uniform . . . If you click on her portrait above, it will take you to a Wikipedia biography of this top USAF female fighter pilot. ABOVE: A video about Lt. 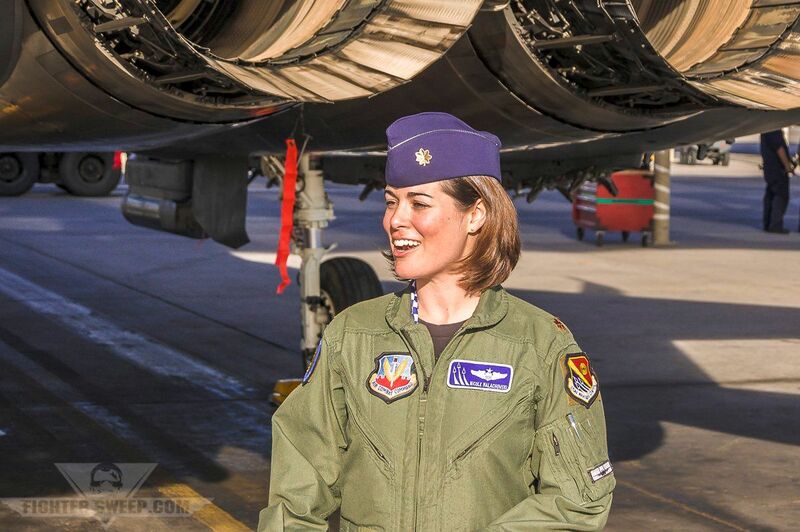 Colonel Nicole “Fifi” Malachowski, the first female member of the actual USAF Thunderbirds official Demonstration Team. It is 3:30 long. The above Video is of a talk by Colonel Nicole “Fifi” Malachowski to the “Fighter Sweep” group. It is quite a long program: 1:20:22 in length. Malachowski first appears in the video at the 9:00 minute mark. 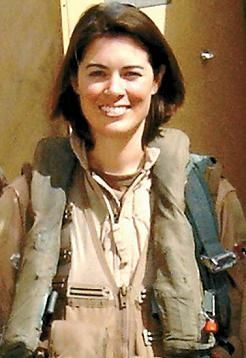 Nicole “Fifi” Malachowski in flight gear. The topmost inspirational video is about the first female US Air Force Thunderbird aerobatic pilot. The USAF Air Demonstration Squadron (“Thunderbirds“) is the air demonstration squadron of the United States Air Force (USAF). The Thunderbirds are assigned to the 57th Wing, and are based at Nellis AFB, Nevada. Created in 1953, the USAF Thunderbirds are the third oldest formal flying aerobatic team (under the same name) in the world, after the US Navy Blue Angels formed in 1946 and the prestigious French Air Force Patrouille de France formed in 1931. The Thunderbirds Squadron tours the United States and much of the world, performing aerobatic formation and solo flying in specially marked aircraft. The squadron’s name is taken from the legendary creature that appears in the mythologies of several indigenous North American cultures. Then Major Malachowski standing under afterburners of an F-15 Fighter, the aircraft which she was assigned to fly at the time. When Nicole Ellingwood (her maiden name) went to High School in Santa Maria, California, she was an active member of both the Civil Air Patrol (CAP) and also engaged in the High School’s Air Force Junior ROTC (JROTC) program, as well. Quickly displaying her skill as a leader, young Ms. Ellingwood rose to the highest Cadet rank attainable, that of full Cadet Colonel. She started working on her pilot’s license before graduating from high school, and achieved her pilot’s license at the age of 16. Nicole graduated from Western High School in Las Vegas in 1992 and went on to the United States Air Force Academy from there. Obviously highly motivated, Nicole graduated at the top of her pilot’s training class in the Air Force. Below short ( 3:58) video at Air Show includes Nicole giving ride to CNN reporter Alex Quade. On 1 March 2013, the USAF announced that due to budget cuts, aerial demonstration team performances would cease indefinitely, effective 1 April 2013. On 6 December 2013 the Thunderbirds announced their 2014 schedule and the resumption of their appearances. The Thunderbirds Squadron is a named USAF squadron, meaning it does not carry a numerical designation. It is also one of the oldest squadrons in the Air Force, its origins dating to the organization of the 30th Aero Squadron, formed at Kelly Field, Texas on 13 June 1917. Officers serve a two-year assignment with the squadron, while enlisted personnel serve three to four years. As the squadron performs no more than 88 air demonstrations each year, replacements must be trained for about half of the team each year, in order to provide a constant mix of experience. In addition to their air demonstration responsibilities, the Thunderbirds are part of the USAF combat force and if required, can be rapidly integrated into an operational fighter unit. Since 15 February 1974 the Thunderbirds have been a component of the 57th Wing at Nellis AFB. Since 1953, they have flown in front of more than 300 million people. F-16 Fighting Falcon The Thunderbirds performing the crossover break. The Thunderbirds perform aerial demonstrations in the F-16C Fighting Falcon, and they also fly two F-16D twin-seat trainers. The F-16 has been the demonstration aircraft for the Thunderbirds since the 1983 season. In January 1982, several members of the squadron were killed in what became known as the “Diamond Crash” of T-38 Talon aircraft which the squadron had flown since 1974. Partially as a result of that accident, the squadron switched to the F-16A, and sat out the 1982 airshow season and spent that year retraining and transitioning over to the new aircraft to ready themselves for the 1983 season. The F-16, however, had been considered for transition prior to the accident. In rebuilding the Thunderbird Team, the Air Force recruited previous Thunderbird pilots, qualified each in the F-16A, and had them begin by flying “two-ship” maneuvers, then expanded the program one airplane at a time up to the full six airplanes. Beginning in June 1982, the F-16 Thunderbirds were led by Major Jim Latham. The team continues to fly the F-16, having switched from the F-16A to the F-16C in 1992. Only a few minor modifications differentiate a Thunderbird from an operational F-16C. These include the replacement of the 20 mm cannon and ammunition drum with a smoke-generating system, including its plumbing and control switches, the removal of the jet fuel starter exhaust door, and the application of the Thunderbirds’ glossy red, white, and blue polyurethane paint scheme. All of the modification work is performed at the maintenance depot at Hill AFB near Ogden, Utah. Other than those modifications, the aircraft are taken from the standard USAF inventory as production fighters, and can be returned to an operational squadron in short order without any major modification. General Dynamics F-16A/B Fighting Falcon During the switch to the F-16A the Thunderbirds acquired new block 15 aircraft which they operated from 1983 to 1991, making the team one of the last USAF units flying the older F-16A’s before transitioning into new C’s. They also operated the two-seat F-16B during this time for training new pilots and for VIP flights, these being replaced by the F-16D when the rest of the squadron transitioned to the F-16C. Two F-16s demonstrate a Reflection Pass Lockheed Martin F-16C/D Fighting Falcon (Block 32) The block 32H/J aircraft currently assigned to the Thunderbirds were built in 1986 and 1987, and operated by the Thunderbirds from 1992 to 2008. At their retirement, they were some of the oldest operational F-16s in the Air Force. Lockheed Martin F-16C/D Fighting Falcon (Block 52) In the 2009 show season the Thunderbirds transitioned to an updated version of the F-16 fighter. The Block 52s have an upgraded avionics package that brings the Thunderbird fleet into alignment with the rest of the worldwide F-16 fleet. This entry was posted in AVIATION NEWS, NEW VIDEOS and tagged 1st Female Thunderbird Pilot, F-15 Eagle, F-16 Fighting Falcon, Nicole Ellingwood, Thunderbirds, USAF on February 2, 2018 by FASFRIC.